east side bride: YAY! And: Yes. 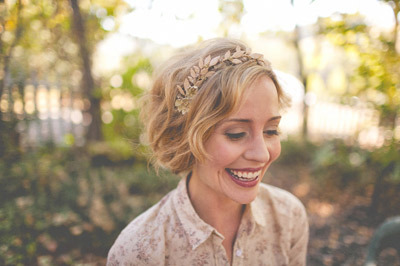 Headpiece by BHLDN but I don't even care because she's rocking it. 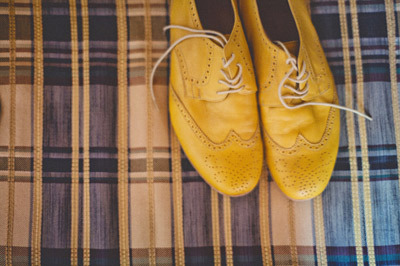 Grooms' shoes by I don't even know but they are AWESOME. oh my, it is beautiful! Groomie's shoes are Rachel Comey. Which is awesome. More proof you were right about the laurel wreath. This one is so subtle and beautiful! Its a beautiful wedding but what really makes it is that they both just look crazy happy in every photo. Wow. I'm usually allergic to these vintage/rustic weddings but that couple is so happy and adorable together, I can't even hate on the tree full of Mason jars. Agree - this is just so cute and they look so freaking happy! What a beautiful venue for the ceremony too. I am in full agreement with everything Miriam said. Can't even hate on the tree of Mason jars, this couple is so cute. yes. their cuteness almost broke my computer. Beautiful. But, seriously, $560 for a HAIR PIN? Good lord. I agree with ach, she must have REALLY loved it...and it does look beautiful on her. It def looks better on her than the model.